You will see all public folders you have. Click the one you need. 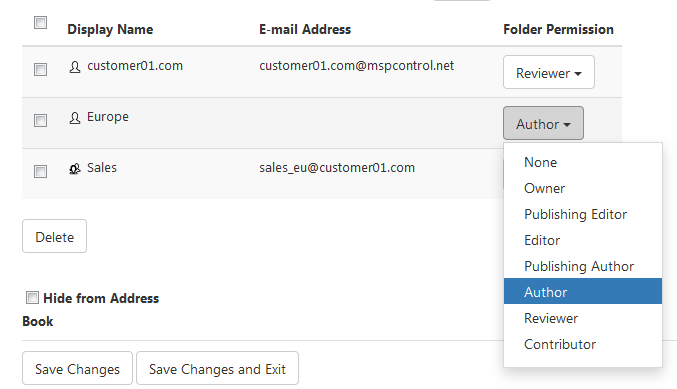 First, you can make this folder Mail-Enabled, meaning that users can post to the public folder by sending an email message to it. 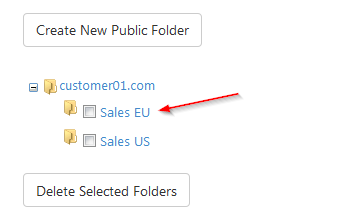 You have to specify email address for the public folder and click Enable Mail Public Folder. Next, you can add accounts, groups, and users to this folder and grant them permissions: None, Owner, Publishing Editor, Editor, Publishing Author, Author, Reviewer, and Contributor. To do so, select accounts and click Add. None means user is not permitted to do anything in a folder. Contributor can create items and files (No read/list permissions). Reviewer can read items and files. Author and publishing author can create, read items and files, modify and delete his own items and files. Editor can create, read, modify and delete all items and files. Publishing editor can do the same plus create subfolders. Owner has all permissions of publishing editor and can Change Permissions (All rights in the folder). 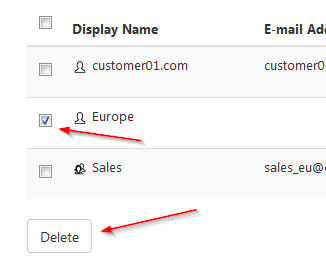 Now for every group and user you can select a role from the drop-down menu in the right. You can also delete groups or users from this folder. Just check them in the left and click Delete. Finally, you can Hide this folder from address book. When you're done here, click either Save Changes or Save Changes and Exit. The first option will leave you at this page, the second will redirect you to the list of all public folders you have.